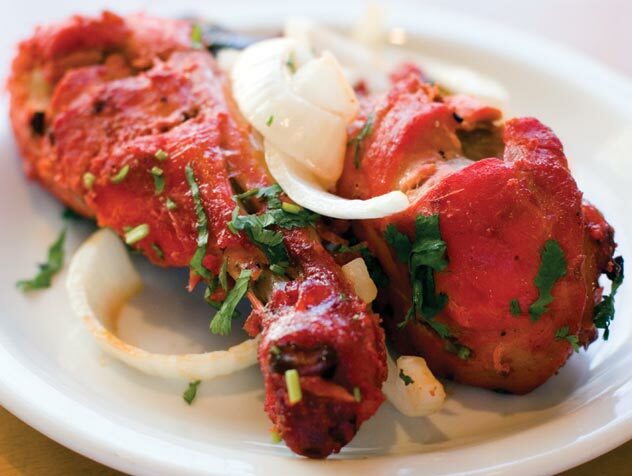 Now, for many North Indian (doesn't matter whether they are living in Delhi or Yorkshire), the ever delicious bite of 'Tandoori chicken' just can't be beat! Nothing different with me. I always had this fascination of having chicken (now I prefer mutton) made me ask, how they cook it? It was just my interest and taste buds for this dish that made me cook it in home microwave oven. So, last weekend I told my wife that I am gonna roast a whole chicken and by seeing that twinkle in her eye just at the prospect of digging into some chicken made me even more determined to cook it really nice. I was not going to lose a chance to impress her! See this Tandoori Chicken Recipe which I made. Now for this dish, preparation is 75% of cooking! Because it takes hell lot of time just to prepare to start cooking! 1st marinade, 2nd marinade, wait for 4 hrs. And yeah...before all that marinade, slicing the whole chicken at the right places! But yeah, nothing looks hard or difficult when you enjoy doing it! Now, normally I love making others eat when I cook because it really makes me happy to feast others! But this time I was so selfish! It was just me and my wife! Nobody else was invited! Apologies my dear friends who keep on asking me to call them for dinner! Next time I will definitely share my Tandoori Chicken! And yeah!!! Next on my trial list will be the oh so buttery....The Butter Chicken!